Make employee engagement part of the conversation all year long by incorporating it into your ongoing internal communications. 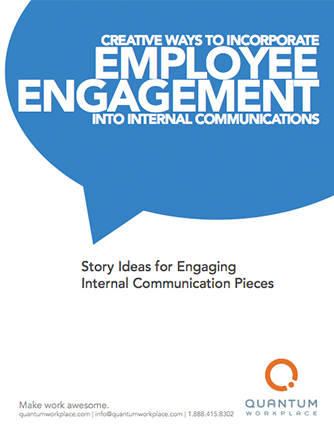 This ebook is packed with ideas from stories and letters to tips and videos that you can publish to your Intranet, internal newsletter, or any other source of employee news. You’ll gain tips on how to cover employee survey results, write spotlights on successes, provide updates on engagement action, and much, much more. Your internal communication to employees can make a major impact on improving engagement. Make sure you’re taking full advantage of it!